From the bride… Hunter proposed to me at Highland Mary Lake in Silverton. We had a picnic and when I got up to get some wine, he popped the question. It was beautiful and unexpected. We wanted to feel like we were being married in nature where we spend the majority of our time together. 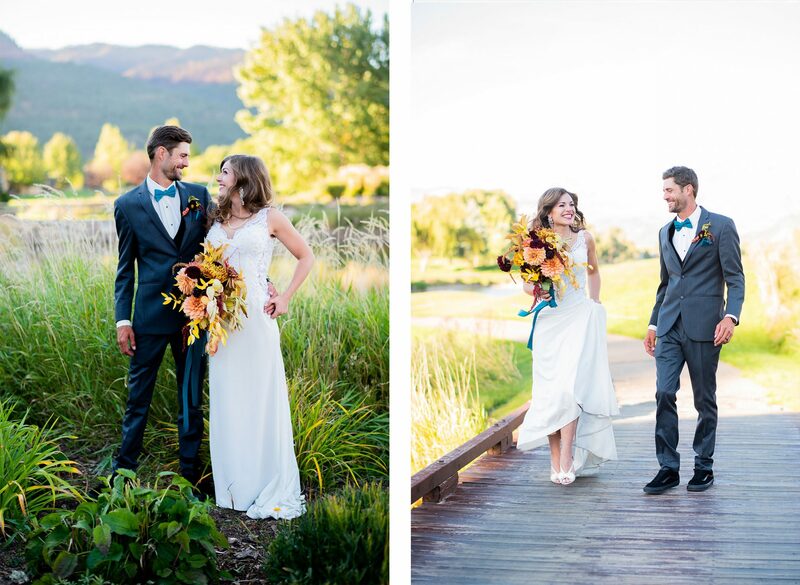 We wanted the autumn colors, the wonderful weather, and a vintage Hollywood glam style. My dress and long veil were very classic with lace with subtle pearls. I felt just the way I had hoped. 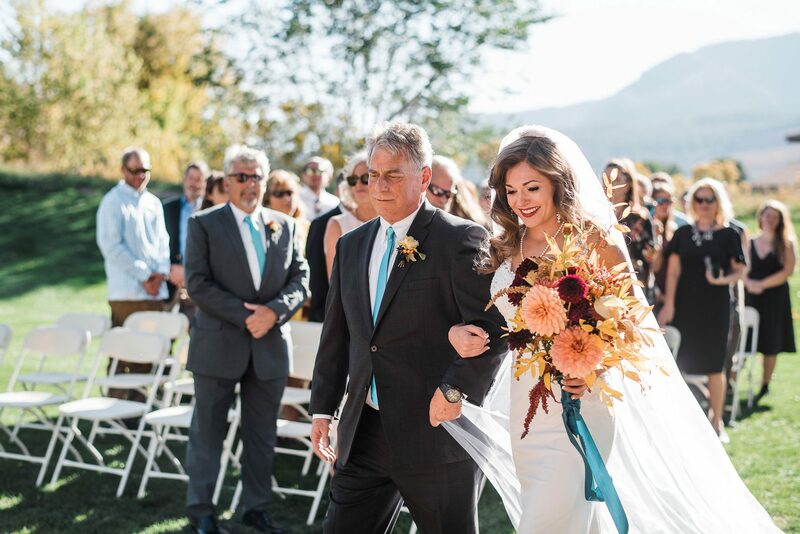 I remember taking a deep breath at the beginning of walking down the aisle and feeling very calm looking at the man I am going to spend the rest of my life with. 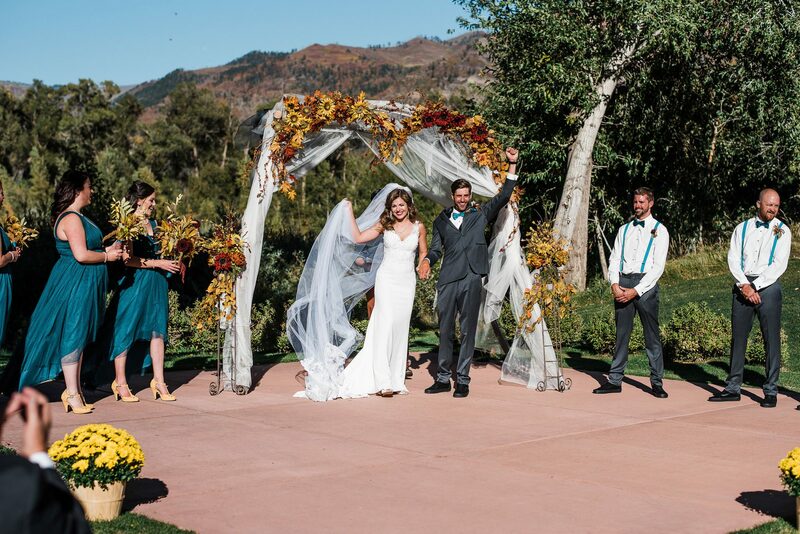 The ceremony was at the Dalton Ranch Golf Club. 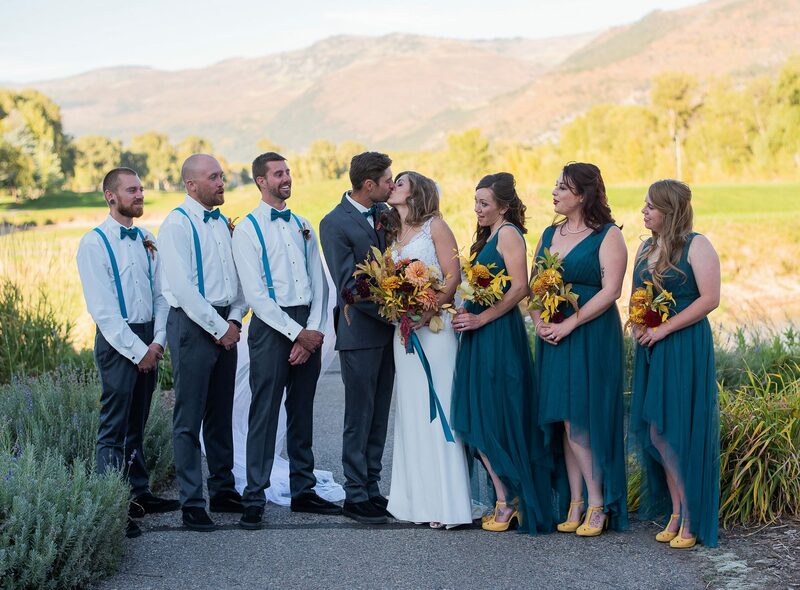 It is a lovely setting with green grass and beautiful trees, and views of the Animas river. The red cliffs in the background were a bonus. The weather was perfect! Give yourself at least a year to plan your wedding. Make sure you are not rushed on the day of. Also, relax! Your guests are there to celebrate your special day and won’t care if something goes wrong. 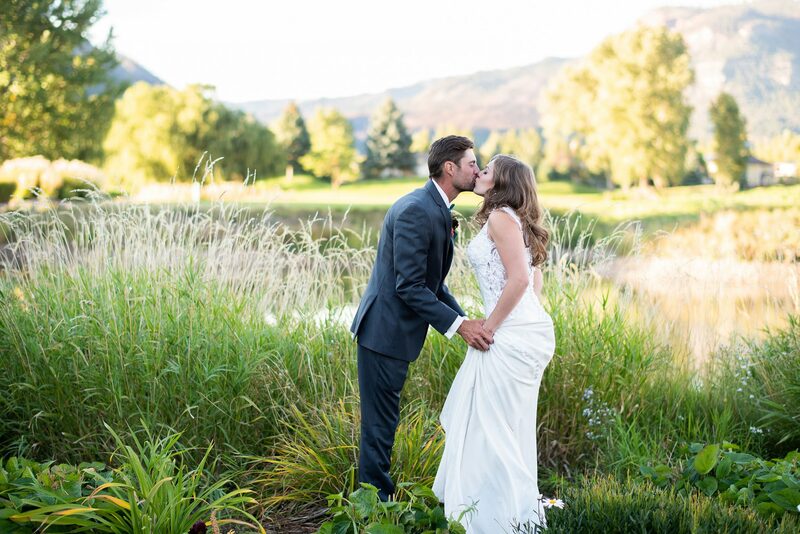 Venue & Caterer: Dalton Ranch Golf Club. 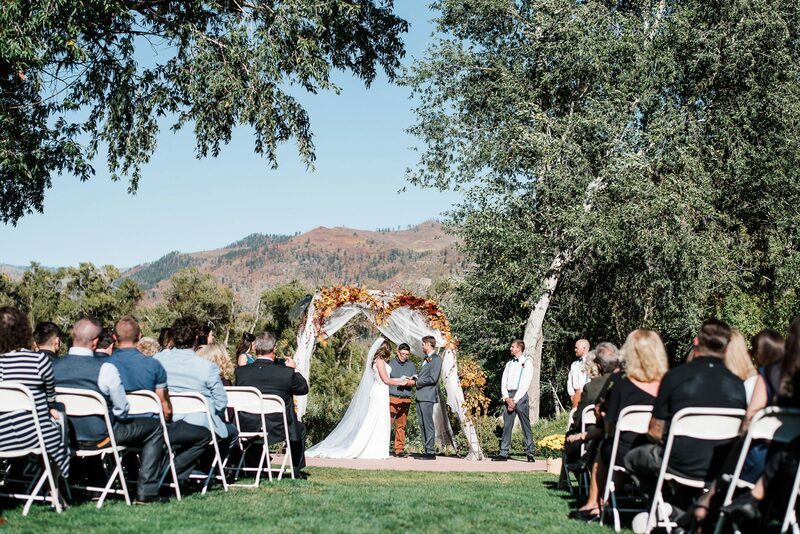 A beautiful setting with the river and red cliffs in the background and they accommodate for everything. They have tables, linens, chairs, table cloths, a PA system, full service, catering, and a bar. We both got ready on-site. Bridget was our event coordinator at Dalton and she was always available to answer questions, give us advice, and show us the venue anytime we wanted. We ordered the Spanish menu and they even special ordered off the kids menu for my 2 nephews. The food was great and they put chips and salsa on the tables for guests to snack on before the buffet was ready. They also cleanup for you and let you pick up your decorations the next day. We would highly recommend them. They made our day stress free!